I was g-chatting with my little brother the other day and he typed ~@~ and what did I see? That's what little brothers are for. 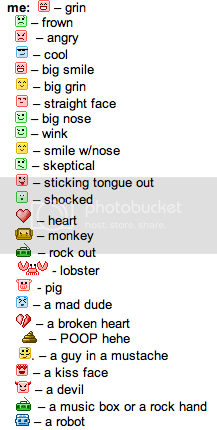 So then of course I wanted to learn all about "secret emoticons" and found a plethora of entertainment. Now if you g-chat with me - beware! I've got lots of emoticons up my sleeve! How's that for a random Friday the 13th post? I feel so extremely happy that my kids taught me how to make a picture of poop out of keyboard characters. I am one proud malm! cute dude! and thanks for dropping by, appreciate! The One with Happy 18th Birthday Allie! The One with Isn't It Ironic?